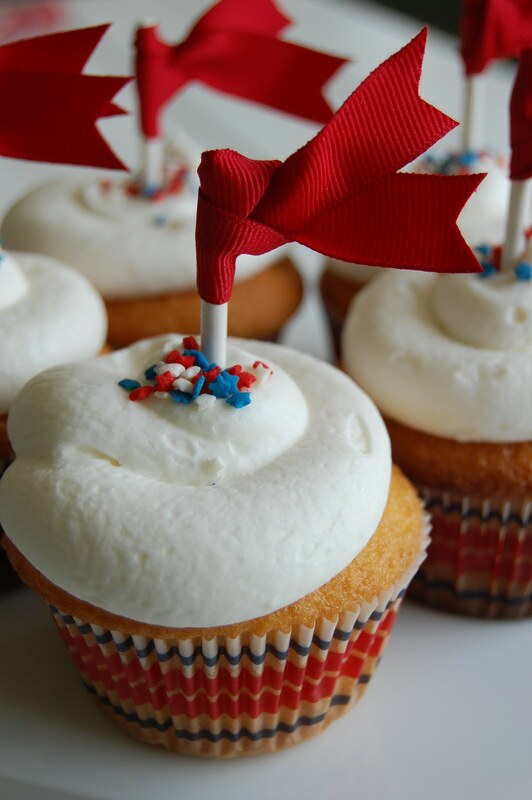 Love and Life at Leadora: Happy 4th of July! Happy 4th of July! For some reason, the holiday snuck up on me, so sadly I didn't decorate the house this year. I did have a chance to do some baking, and so I decided to copy Martha Stewart's 4th of July cookies from the cover of her July issue. These are just like the spiderweb cookies I made for Halloween. I love this technique, since it is easy and fool proof. Very cute...love the cookies and the cupcakes. You are right the ribbon flags are adorable. I wanted to make those cookies but just couldn't find the time. They turned out wonderful! Cute idea for the cupcakes!!! Hope you had a fun filled day! You made the Martha cookies and did and fantastic job!! They look amazing! Hope you had a fun 4th. Are there any leftovers? If so, I'll be right over! How cute are those cookies and cupcakes! They look yummy! Now I'm sad, I didn't bake anything! I'll just have to live thru you! 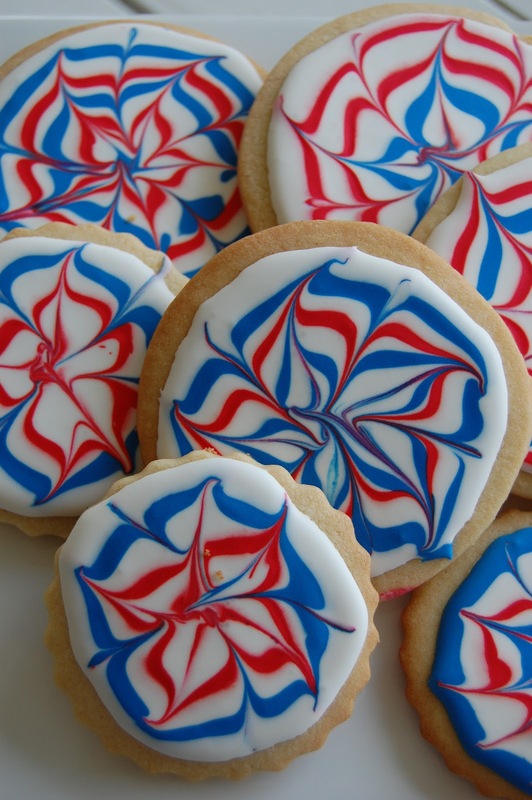 The cookies look wonderful and I do love the little flags! Perfect for the 4th! Super cute! Both the cookies and cupcakes! I love those flags! I always look forward to your blogs...they are both fun and informative! I hope everyone is enjoying summer at LALAL! Love the cookies and the cupcakes...too cute. I just have a question...Do you make your own royal frosting or do you buy it made? Can you even buy it made already? I've been wanting to try this cookies but how to make the frosting always stumps me...Please share :-) Hope you had a wonderful 4th of July. The cupcakes,and cookies look so good!! Perfect for the 4th. Such cute ideas!!! I am glad to have discovered you!!! Those are adorable! The cookies are so festive and pretty - must try them! Such a nice idea! i should have baked some for our July 14th!